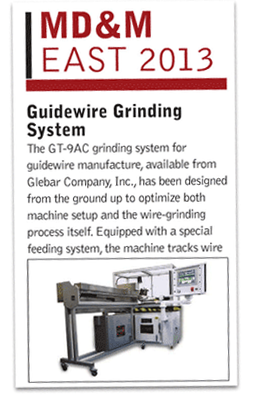 The GT-9AC grinding system for guidewire manufacture, available from Glebar Company, Inc, has been designed from the ground up to optimize both machine setup and the wire-grinding process itself. Equipped with a special feeding system, the machine tracks wire position over the length of the loader, eliminating the need for the wire to have an exact cut length. Additionally, the wire profile is shaped with a high degree of repeatability. Length resolution is 1µm and the resolution of the diameter is 0.1µm at grinding speeds of 4 ft/min.